“Healthy worker” effect (HWE) is a special type of selection bias, typically seen in observational studies of occupational exposures with improper choice of comparison group (usually general population). This phenomenon has been documented in several studies and methods have been developed to tackle this issue. In this paper, we will review the historical background that led to the discovery of this phenomenon, factors associated with this phenomenon, and summarize epidemiological and statistical methods to deal with this issue. The term HWE was first coined by McMichael  in 1976, who defined it as “the consistent tendency of the actively employed to have a more favorable mortality experience than the population at large.”He found that when standardized mortality ratios (SMRs) are calculated with the general population as reference, the SMR tends to underestimate the mortality experience of the occupational population. He further found that this “effect” did not affect all groups equally even in the same population and recommended that “allowances needed to be made for this unequal effect in different age groups, races, causes for death, elapsed time periods of observation and even different work groups.” Thus, in his paper McMichael not only coined the term but also provided clues to statistical methods that needed to be developed to deal with this issue. However, this effect had been reported almost a century earlier by William Ogle  in a letter to the Registrar General of Births, Deaths, and Marriages. He observed lower mortality rates in certain occupations requiring hard labor, contrary to what was expected. He speculated accurately that this was due to self-selection by individuals capable of performing these tasks which was related to these observations on mortality. Subsequent studies in the interim period observed the effects of HWE without accounting for the discrepancy. Among them is the famous study by Doll et al. who observed the phenomenon among gas workers. In their landmark paper, Doll et al. estimated the age-adjusted SMR among coal-exposed gas workers versus the general population. They found, contrary to their expectations, that SMR among the high-risk population of gas workers was less than 100 or the exposure to coal was found to be protective in their study, as compared with the general population. However, when they compared the occupationally exposed workers divided into groups as per their exposure status [those with heavy exposure in carbonizing plants (class A), intermittent exposure or exposure to conditions in other gas-producing plants (class B), and such exposure (class C)], in internal comparisons their results were different as they had accounted for HWE. Although their paper pre-dated the paper by McMichael, they had used one of the most common ways to adjust for HWE. Although McMichael spoke of the HWE phenomenon and the way to adjust for it by way of internal comparisons, other researchers missed this effect as they continued estimating SMRs by comparing the mortality in occupational cohorts with the general population, leading to erroneous conclusions. The classic paradigm for studies in epidemiology is by way of comparisons of apples to apples and not apples to oranges. HWE is a selection bias resulting from the latter or the improper selection of a comparison group, i.e., the general population. The “general population” is a heterogeneous mixture consisting of both “healthy” people and “unhealthy” people. Those who are not “healthy” such as children, elderly retired people, and ill people are less likely to be employed. Thus, in contrast to the general population, the employed workforce tends to have fewer sick people. In fact, if a healthy person falls ill with say heart disease or stroke or cancer, they will most probably be excluded from employment or have to go on medical leave. However, they are not excluded from the general population and the mortality statistics calculated for the general population. Many occupations, such as fire-fighters, police, and military, have to undergo strenuous physical and endurance examinations to assess their physical health before they are hired to work in such professions. Thus, comparisons of mortality rates between an employed/occupational group and the general population will be biased, as not all in the general population will be at “risk” of being employed. With this in mind, let us see an example. Suppose exposure to a noxious occupational exposure truly increases the risk of mortality by 20% [risk ratio (RR) = 1.2]. Let us further assume that the general population has an overall risk of death that is 10% higher than the occupational group. Using the general population as the reference group in this case would lead to an underestimation of the risk ratio (RR = 1.1). Thus, any observational study of workers or among occupational cohorts could potentially face this problem to a varying degree. Most studies find an average underestimation of about 25% of the association of a noxious stimulus on mortality as a result of HWE.,,,,,,,,,,,,,,, This underestimation of risk implies that being exposed to the noxious stimulus was protective. ,,,, HWE may not be complete and may only partially mask the excess mortality  and in rare cases may not be protective. So far we have spoken of HWE in terms of improper selection of the reference group. In addition, epidemiologists have classified HWE as selection bias, confounding, or both [Figure 1]. Selection bias: HWE can be conceptualized as a form of selection bias because the comparison group is “systematically different in characteristics” from the exposed group of workers, who had to meet a certain criteria (their occupation) in order to be selected [Figure 1]. Most occupational studies will exclude workers who quit or leave after a short period of service, further compounding the issue. The ones who leave have systematically different characteristics than the ones who stay in the occupation. This self-selection into the occupation and the heterogeneous nature of the comparison group are reasons why HWE is considered to be a form of selection bias [Figure 2]. Confounding: The reasons for HWE being considered a confounder may have less substantial reasoning as one may view HWE due to inappropriate selection of a comparison/control group and hence selection bias as opposed to confounding [Figure 3]. However, we define a confounding factor as a predictor of both the exposure and outcome and yet is not in the causal pathway. As discussed above, workers in professions are healthier and able-bodied. If they fall ill or as they age, they leave the workforce. Thus, if we consider the health status to be a predictor of exposure (or being able to work in an industry) and we know that the health status is a predictor of mortality, we can now consider HWE to be a confounder. Later we will develop this concept more and show how HWE can be considered to be a time-varying confounder as the health status declines over the years and more specialized methods are needed to take this into account. Both: HWE can also be thought of as a combination of a selection bias and confounding, as it satisfies the criteria for both. There is self-selection based on health status leading to a confounded association between the exposed group and mortality. This may underestimate the effect of exposure to noxious occupational stimuli on subsequent mortality when compared to the general population. 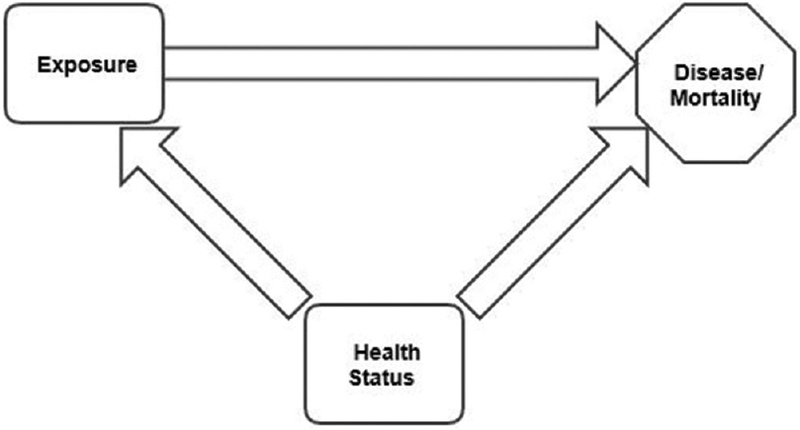 This discrepancy in the health status can be a result of multiple factors [Figure 4]. Advantages of working: Workers tend to remain employed not only based on their health status but also as a result of their improved access to healthcare, regular screening for disease, early treatment of conditions, and physical exercise. Each of these in turn maintains their health status. Based on the above, one may assume that if one works in an industry with no noxious exposure then their overall mortality experience would be better. However, HWE is not constant and depends on several factors  [Figure 2] and [Figure 5]. Thus, the HWE is not constant across age groups, gender, race, and workers nor is it constant over time. Hence, assessing HWE and accounting for it in statistical analyses is complicated and requires sophisticated methods. As per the counterfactual definition of cause, the best comparison group for a specific population at a time point is the same population at the same time point without the exposure of interest  – quite impossible as that would involve time travel. Many approaches have been developed to minimize HWE as we can never truly neutralize this effect. Here we explore some of these methods and their potential drawbacks. These methods do assume that only those with the same prior exposure history can be compared. Further, their accuracy depends on how well past exposures are captured. Though these methods seem counterintuitive, as they do not seem to relate traditional measures of exposure with mortality, they are very effective in reducing the bias seen as a result of HWE in traditional studies. HWE is a form of selection bias or confounding that results from improper choice of a reference group. Multiple methods have been put forth to overcome this issue. However, more work is needed to develop methods that can overcome the biases introduced by HWE. McMichael AJ. Standardized mortality ratios and the “healthy worker effect”: Scratching beneath the surface. J Occup Med 1976;18:165-8. Ogle W. Letter to the Registrar-General on the mortality in the registration districts of England and Wales during the ten years 1871-80; 1885. Fox AJ, Collier PF. Low mortality rates in industrial cohort studies due to selection for work and survival in the industry. Br J Prev Soc Med 1976;30:225-30. Doll R, Fisher RE, Gammon EJ, Gunn W, Hughes GO, Tyrer FH, et al. Mortality of gasworkers with special reference to cancers of the lung and bladder, chronic bronchitis, and pneumoconiosis. Br J Ind Med 1965;22:1-12. Rinsky RA, Zumwalde RD, Waxweiler RJ, Murray WE Jr, Bierbaum PJ, Landrigan PJ, et al. Cancer mortality at a Naval Nuclear Shipyard. Lancet 1981;1:231-5. Vinni K, Hakama M. Healthy worker effect in the total Finnish population. Br J Ind Med 1980;37:180-4. Ames RG, Trent B. Mobility of diesel versus non-diesel coal miners: Some evidence on the healthy worker effect. Br J Ind Med 1984;41:197-202. Dahl E. High mortality in lower salaried Norwegian men: The healthy worker effect? J Epidemiol Community Health 1993;47:192-4. Zock JP, Heederik D, Doekes G. Evaluation of chronic respiratory effects in the potato processing industry: Indications of a healthy worker effect? Occup Environ Med 1998;55:823-7. Iwatsubo Y, Matrat M, Brochard P, Ameille J, Choudat D, Conso F, et al. Healthy worker effect and changes in respiratory symptoms and lung function in hairdressing apprentices. Occup Environ Med 2003;60:831-40. Agerbo E. Effect of psychiatric illness and labour market status on suicide: A healthy worker effect? J Epidemiol Community Health 2005;59:598-602. Fornalski KW, Dobrzyński L. The Healthy Worker Effect and Nuclear Industry Workers. Dose Response 2010;8:125-47. Naimi AI, Cole SR, Westreich DJ, Richardson DB. A comparison of methods to estimate the hazard ratio under conditions of time-varying confounding and nonpositivity. Epidemiology 2011;22:718-23. Thygesen LC, Hyidtfeldt UA, Mikkelsen S, Bronnum-Hansen H. Quantification of the healthy worker effect: A nationwide cohort study among electricians in Denmark. BMC Public Health 2011;11:571. Nishikitani M, Nakao M, Tsurugano S, Yano E. The possible absence of a healthy-worker effect: A cross-sectional survey among educated Japanese women. BMJ Open 2012;2. Naimi AI, Cole SR, Hudgens MB, Brookhart MA, Richardson DB. Assessing the component associations of the healthy worker survivor bias: Occupational asbestos exposure and lung cancer mortality. Ann Epidemiol 2013;23:334-41. Chowdhury R. A Large Cohort Linkage Study of Lead Exposure for Mortality & End Stage Renal Disease. Emory University; 2013. Chowdhury R, Darrow L, McClellan W, Sarnar S, Steenland K. Incident ESRD among participants in a lead surveillance program. Am J Kidney Dis 2014;64:25-31. Chowdhury R, Sarnat SE, Darrow L, McClellan W, Steenland K. Mortality among participants in a lead surveillance program. Environ Res 2014;132:100-04. Chowdhury R, McClellan W, Sarnat S, Mukhopadhyay A, Darrow L, Steenland K. Survival Patterns of Lead-Exposed Workers With End-Stage Renal Disease From Adult Blood Lead Epidemiology and Surveillance Program. Am J Med Sci 2015;349:222-7. Steenland K, Chowdhury R. Renal disease incidence among 58 000 male workers with blood lead measurements. Occup Environ Med 2014;71:A45-A45. Solan S, Wallenstein S, Shapiro M, Teitelbaum SL, Stevenson L, Kochman A, et al. Cancer Incidence in World Trade Center Rescue and Recovery Workers, 2001-2008. Environ Health Perspect 2013;121:699-704. McNamee R. Confounding and confounders. Occup Environ Med 2003;60:227-34. Arrighi HM, Hertz-Picciotto I. 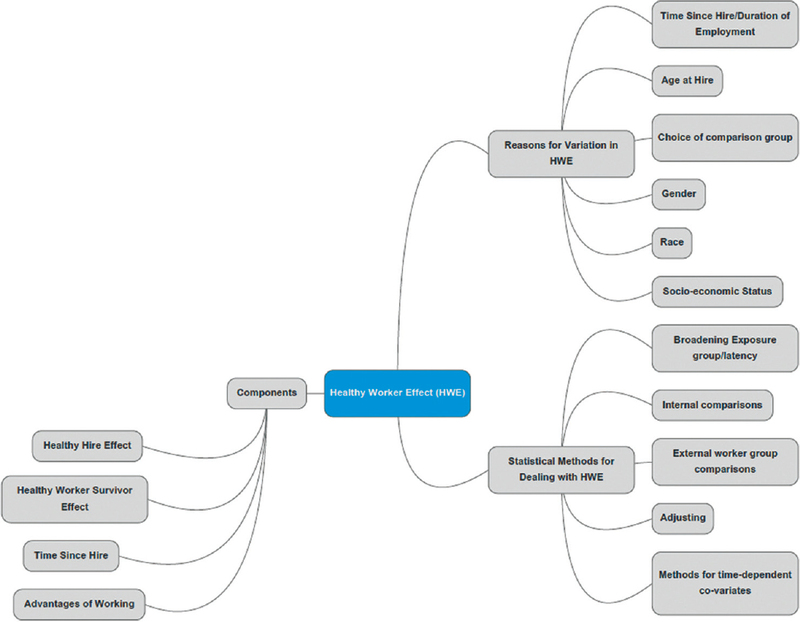 The evolving concept of the healthy worker survivor effect. Epidemiology 1994;5:189-96. Arrighi HM, Hertz-Picciotto I. Controlling the healthy worker survivor effect: An example of arsenic exposure and respiratory cancer. Occup Environ Med 1996;53:455-62. Le Moual N, Kauffmann F, Eisen EA, Kennedy SM. The Healthy Worker Effect in Asthma: Work may cause asthma, but asthma may also influence work. Am J Respir Crit Care Med 2008;177:4-10. Shah D. Healthy worker effect phenomenon. Indian J Occup Environ Med 2009;13:77-9. Monson RR. Observations on the healthy worker effect. J Occup Med 1986;28:425-33. 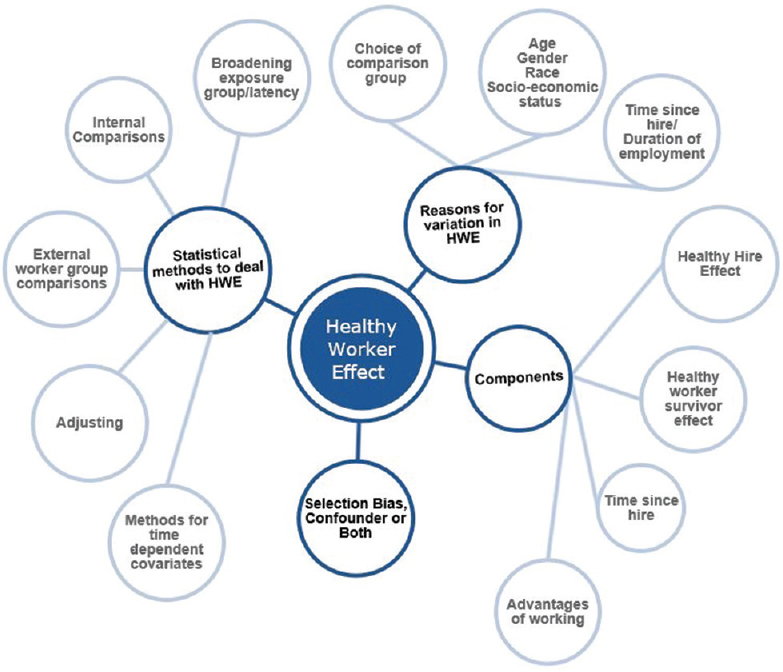 Symons JM, Kreckmann K, Le H, Starks S. Components of the healthy worker effect with quantification for different referent comparisons. Occup Environ Med 2014;71:A119. Lea CS, Hertz-Picciotto I, Andersen A, Chang-Claude J, Olsen JH, Pesatori AC, et al. Gender differences in the healthy worker effect among synthetic vitreous fiber workers. Am J Epidemiol 1999;150:1099-106. Baillargeon J, Wilkinson G, Rudkin L, Baillargeon G, Ray L. Characteristics of the healthy worker effect: A comparison of male and female occupational cohorts. J Occup Environ Med 1998;40:368-73. Costello S, Picciotto S, Rekhopf DJ, Eisen EA. Social disparities in heart disease risk and survivor bias among autoworkers: An examination based on survival models and g-estimation. Occup Environ Med 2015;72:138-44. Parascandola M, Weed DL. Causation in epidemiology. J Epidemiol Community Health 2001;55:905-12. Bolumar F, Porta M. Epidemiologic methods: Beyond clinical medicine, beyond epidemiology. Eur J Epidemiol 2004;19:733-5. Roberts MH, Sim MR, Black O, Smith P. Occupational injury risk among ambulance officers and paramedics compared with other healthcare workers in Victoria, Australia: Analysis of workers' compensation claims from 2003 to 2012. Occup Environ Med 2015;72:489-95. Robins J. A new approach to causal inference in mortality studies with a sustained exposure period-application to control of the healthy worker survivor effect. Mathematical Modelling 1986;7:1393-512. Robins J. A graphical approach to the identification and estimation of causal parameters in mortality studies with sustained exposure periods. J Chronic Dis 1987;40:139S-61S. Neophytou AM, Costello S, Brown DM, Picciotto S, Noth EM, Hammond SK, et al. Marginal structural models in occupational epidemiology: Application in a study of ischemic heart disease incidence and PM2.5 in the US aluminum industry. Am J Epidemiol 2014;180:608-15. Robins JM, Blevins D, Ritter G, Wulfsohn M. G-estimation of the effect of prophylaxis therapy for Pneumocystis carinii pneumonia on the survival of AIDS patients. Epidemiology 1992;3:319-36. Robins JM. Addendum to “a new approach to causal inference in mortality studies with a sustained exposure period-application to control of the healthy worker survivor effect”. Comput Math Appl 1987;14:923-45. Snowden JM, Rose S, Mortimer KM. Implementation of G-Computation on a Simulated Data Set: Demonstration of a Causal Inference Technique. Am J Epidemiol 2011;173:731-8. Vansteelandt S, Keiding N. Invited commentary: G-computation--lost in translation? Am J Epidemiol 2011;173:739-42. Rose S, Snowden JM, Mortimer KM. Mortimer, Response to invited commentary. Rose et al. respond to “G-computation and standardization in epidemiology”. Am J Epidemiol 2011;173:743-4. Naimi AI, Cole SR, Hudgens MB, Richardson DB. Estimating the effect of cumulative occupational asbestos exposure on time to lung cancer mortality: Using structural nested failure-time models to account for healthy-worker survivor bias. Epidemiology 2014;25:246-54. Joffe MM. Structural Nested Models, G-Estimation, and the healthy worker effect: The promise (Mostly Unrealized) and the pitfalls. Epidemiology 2012;23:220-2.